Holder for your favourite magazines, newspapers or vinyl records. The round frame makes it easy to lift the whole and present it in an accessible way. Hoop Magazine Rack can hold up to 24 magazines or records. Zina (of design brand Umbra) keeps magazines, newspapers and vinyl records neatly arranged. The strikingly geometric wire design creates an extra style element. Can stand as well as hang. All your magazines tight and orderly within reach. This magazine rack from Yamazaki is simultaneously an elegant side table. Ideal for a delicious cup of coffee while reading the newspaper in your favorite sofa. Stylish newspaper and magazine holder of Japanese design brand Yamazaki. 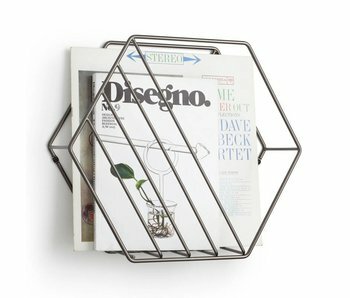 The newspaper rack has a sleek and user-friendly design and is easy to move around.